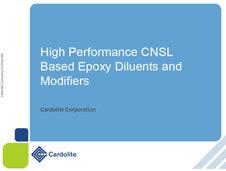 Cardolite® LITE 513E is an epoxy reactive diluent. It contains low total chlorine/halogen content (≤ 1000ppm) and exhibits low color & low viscosity. This glycidyl ether offers reduced shrinkage, moisture resistance, water resistance and balanced mechanical properties. It provides increased flexibility and bond strength. Cardolite® LITE 513E is suitable for solvent-free epoxy adhesive systems. 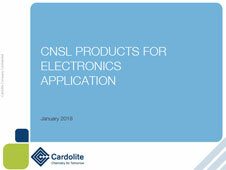 Recommended for electronics and electrical applications include potting and encapsulation.